Golf was created with walking as an important element of the competition, and at the game’s highest levels, it remains a requirement. But, carts have taken precedence for many who play the game, and while that mode of transportation around the course has its benefits (e.g., GPS-equipped or relief for the injured or impaired who need it), walking the course has more. So, if you haven’t walked a round of golf recently, you may be missing out because walking can enhance your golf experience. Here’s what we mean. The primary way walking can better the golfing experience, of course, is exercise. Walking a golf course (depending upon your ability to keep the ball in the fairway) can require covering four to eight miles (or an estimated 17,000 footsteps) up and down rolling hills or extreme elevation. This type of “workout” benefits your cardiovascular system. If you play frequently enough, you may even lose weight, too. The price of golf carts differ from course to course and can range from affordable to costly. But, walking the course is free! Even taking a pull cart, which costs a few dollars, is a far better deal than riding a noisy, gas fume-spewing cart. When you save the money on a cart, you can use it for an extra bottle of water or a thirst-quenching beverage at the 19th hole after the round. Walking is a more efficient way to play the game. 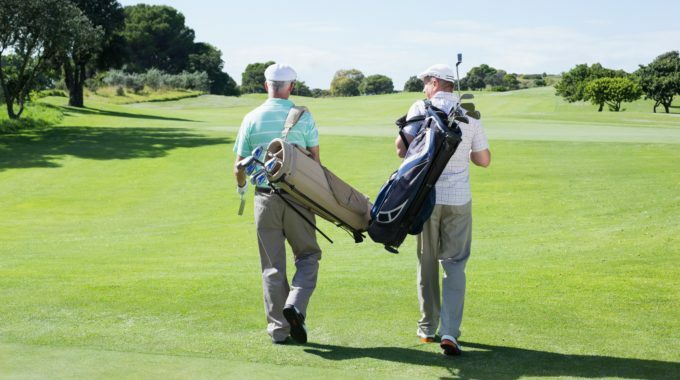 When you are carrying your clubs (or pulling them), you walk toward your ball rather than needing to ride along to watch your cart mate hit their ball. As you walk toward your ball, you can calculate the yardage, distance to hazards and lie for your next shot, and get ready to play it. You don’t have to do the golf-cart tango and try to determine shot order. The pace is steady and in no way rushed or hurried, which can only help with your game. Walking the course is the way the game was meant to be played. By striding the fairways, you are connected to the origins of the game. Centuries ago, the first golfers walked the courses, and when you do the same, you are playing the way they did. That bond with the early traditions of the game is something many golfers seek. Now, we can’t promise this. But, there are places such as The Walking Golfer Society that promote the benefits of walking the course and argue you will shoot better scores (which might be hard to quantify). Their reasoning behind this argument? The motion of walking helps loosen muscles and keeps you limber throughout the round, which can only help your play. They say walking makes the game more social, as walking golfers have time to converse while they walk the fairways. And you have time to “smell the roses” when walking the courses, which are typically very nice places to do that. Those things can contribute to a better attitude for a golfer, which is usually beneficial for everyone’s game. So, that only leaves one questions for me: Why ride?